Fulvio Scolari (born in 1923) began his career in a bakery at the age of eleven. He subsequently worked in a delicatessen and finally ended up in a confectioner’s shop. The next twenty-five years were spent working and travelling the world for the Compagnia Italiana Grandi Alberghi (deluxe hotels). During this period, he began teaching at vocational training schools and on refresher courses for ice-cream makers and confectioners. He participated in international events, and he published recipe books and textbooks, in addition to working as a technical consultant for companies and laboratories of the sector. Today he is the Italian pastry chef par excellence. He is internationally recognised as an expert and keen researcher and divulger of confectionary art. 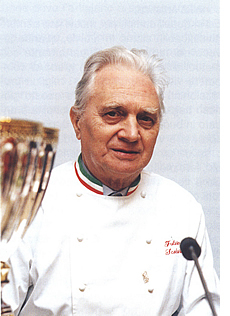 He teaches untiringly to young people and adults, not only directly but also through his books and in articles on “Pasticceria Internazionale”. Scolari is actually one of the few Italian masters that can be considered both one of the leading professionals of confectionary art at the same time a teacher of standing and experience, whereby communicating knowledge has been one of his primary objectives over the years. The first in Italy, he is the author of leading manuals that provide the basic theories of artisanship and which are constantly studied and consulted by professionals of the sector. As for typology, these volumes are different to the large number of elegant illustration-packed publications containing original and modern confectionary ideas that currently fill the shelves of libraries. Scolari’s texts enclose and summarise artisanal know-how, and they are indispensable tools of the trade for anyone who wishes to embark on this professional journey. What have been the most important moments of your long career? There certainly have been many, but one particular moment was when, in a short period of time, I went from being a simple baker in a provincial town to head of the confectionary and ice-cream making sector in the best Italian and international hotels (a job that lasted many years). Another important moment was that of having been able to teach young people in various vocational training schools, and having been able to give them a helping hand into the interesting world of confectionary and ice-cream making. In your time, what did chefs of leading kitchens in the confectionary sector think of the brigade? Leading kitchen chefs (the confectionary of a large hotel was still a part or sector of the kitchen), despite their somewhat independent position, were out-and-out leaders in their work and they knew how to appreciate the ability and desire of components of the brigade to carry out the task at hand. Many of these chefs knew after considerable experience how to be great masters, and working with them was a stimulating way to learn the trade. A large brigade, working under one of these masters, was able to work with great precision and ability. I have often heard those who took part in brigade work say, “It really is quite a spectacle to see you work with such coordination and precision in the midst of so many orders”. The real organiser of this, of course, was the chef. What did a young person have to do in order to learn in a large brigade? Beginning, of course, at the lowest level of the professional ladder, you had to show a strong desire to learn. You had to be prepared to make huge sacrifices and very often this ended in tears. Perseverance and knowing how to be humble when carrying out orders, looking carefully at how others worked, and resisting tiredness and tension with the firm conviction that if you wanted to make it you could. The kitchen or laboratory was the only schools available. Clearly, you had to know how to speak to colleagues who were further up the ladder than you, and you had to speak when possible to the chefs; you had to know how to make the most of the few publications that existed at the time, and you also had to know how to look around you and use every occasion that could help you enhance and improve your professional ability. How do you envisage the future of confectionary? I see a two-coloured future: rose and black. Rose because I believe that artisan confectionary still has enormous possibilities, and so the future is potentially rosy. We have many good confectioners that have known how to develop their work with great skill. You need only look at the extent to which they have raised the level of beauty and quality in the fields of leavened pastry, chocolate, torrone, small confectionary, biscuits, ice-cream, confits, refreshments, and the many types of cake, from oven-baked cakes to sideboard desserts… to ascertain the extent to which the public has known how to appreciate fresh products, high quality, and beautiful creations, and therefore to see the potential for great expansion. But I also envisage a black future because it is impossible to contemplate continuity when so much support is missing, and when there are not strong enough organisations or bodies that really know how to defend and divulge our culture. So many real public confectionary schools are lacking, and young people are not encouraged to take up this type of business. Furthermore, the Italian political class seems entirely unwilling to boost this sector – quality-wise one of the leading sectors of the world, which offers so many possibilities of worthwhile employment. I believe that in cultural and practical preparation there is a possibility for a future. Ignoring this simply means surviving. What would you say is the most representative Italian sweet? This is a difficult question to answer given the quantity of quality sweets we have. However, seeing as I have to give an answer, in light of the success that they have had over so many years, I would say there are two sweets that could answer to this description: the panettone (Milanese cake. A rich Italian bread made with eggs, fruit, and butter) and the gelato (ice-cream). They are beautiful, tasty, and are a pleasure to eat, and they are a demonstration of the ability and imagination of Italian confectioners. You have dedicated a lot of your time to study, research and writing, especially manuals. Why? The reason is very simple: the desire to write things that are useful for the sector and which have never been written, or if the subject has already been covered by others then to deal with it from another angle, such as to offer a broad, modern and informed vision of the subject matter. What are the biggest problems that a confectioner faces? The answer needs to be divided into ‘confectioner-employer’ and ‘confectioner-employee’ – both have problems but they are different. For the employer, I believe that the high number of legal norms that need to be respected leave little time to real laboratory work. I am not suggesting that one should disregard norms, but I wonder if the legislator knows just how busy the confectioner’s work really is and how many hours a day a confectioner has to work if he is to have a shop that is in line with the times. Problems also exist for the employee confectioner, especially if he is young, given the difficulty of finding a good partner owing to an increasing need to work Saturdays, Sundays and on festivities, days in which most people are on holiday. Working hours often do not match and we all know the importance and need to find sincere affection in life. Also, as I mentioned earlier, there is a lack of confectionary schools that can provide comprehensive training in order for us to understand our roots, the wealth of our culture and our tradition. That fundamental grounding is missing; a grounding that would be the instrument to resist the hammering propaganda and the commercial forces of industry in addition to the invasion of an ever more open market. What advice would you give to a young confectioner? Passion and love, training and curiosity, obtained at school, on professional training courses, and by travelling, all enhanced by personal effort. Patience is a necessity. I think our sector is interesting owing to its formative nature. It can provide a high degree of satisfaction, it is not mechanical even if machines are used, one can see results as the work proceeds and one can be a genuine artist of the sweet seeing as we live in the midst of art and cultural beauty. Furthermore, after centuries of living in Italy, we have imagination and we know about quality living. All of this ensures, perhaps at the cost of the inevitable sacrifice, that we can become real artisans and artists. Among the many texts that you have written, there is also a complete manual on decoration. Why? Art is everywhere, especially in Italian culture. Confectionary art is vast and captivating. A good sweet therefore also has to be beautiful, but not necessarily complicated. Mine is a practical manual rooted in tradition because before being able to innovate, you must first know the basics. In your opinion, how do you think Italian decoration is evolving? There are many technical supports which all too often substitute decorative art, the individual’s real expression. One needs to reach a balance in which the artisan does not renounce his desire for expression and improvement. How can one develop an artistic sense? Art is innate, even if it can and has to be stimulated. The problem is that schools limit the potential of individuals by paying little attention to beauty and the practice of beauty. And this is a general problem, all around the world. One needs to encourage young people to cultivate, understand, and interpret art. This text on decoration by Fulvio Scolari and Teresio Busnelli has been written in Italian for young people and for confectioners who want to learn methods of decoration and garnishing using various techniques. The entire Italian decorating tradition, illustrated using simple tasks, is set out in the more than 300 pages in such a way that finishings on sweets become a means for evaluating professionalism, improving aesthetics and boosting sales. decorating with royal icing and an icing bag.